King of Poland from 992 to 1025. According to the Polish preacher Matheusz Bembo, a contemporary of Sigismund III. (beginning of the seventeenth century), the first Jews settled in Poland in the reign of Boleslaw Chrobry; and the historian Maciejowski ("Zydzi w Polsce na Rusi i Litwie") states that this king treated the Jews with the utmost kindness. 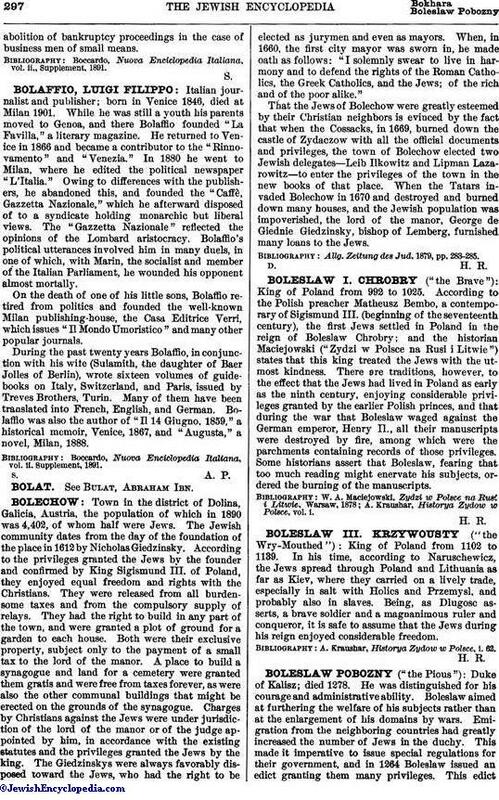 There are traditions, however, to the effect that the Jews had lived in Poland as early as the ninth century, enjoying considerable privileges granted by the earlier Polish princes, and that during the war that Boleslaw waged against the German emperor, Henry II., all their manuscripts were destroyed by fire, among which were the parchments containing records of those privileges. Some historians assert that Boleslaw, fearing that too much reading might enervate his subjects, ordered the burning of the manuscripts. A. Kraushar, Historya Zydow w Polsce, Vol. i.